Oscar is a franchised brand, with individual operators delivering the food to your door. It's been around for a good number of years and the range of food on offer has evolved to the distinct ranges currently on their list. 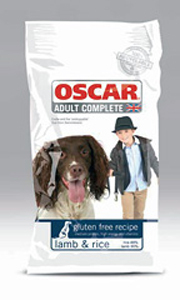 The Oscar range seems to have been rationalised of late, with less on offer than there used to be, but there's still a range from basic wheat-based to the better quality rice-based and a grain-free recipe. There's a range of foods for different types of pets, and covering the various lifestages. 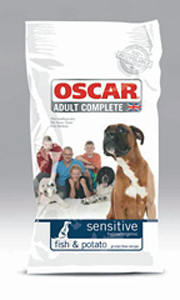 Oscar seem to be trying to cover several bases with their range, which is fair enough, but be careful when choosing from the range of you have a dog with sensitive digestion, as their cheaper options do contain a large proportion of wheat. The more expensive natural recipes compare well with many of the other similar foods on the market. It is very easy to have pet food delivered to your home now, often on overnight delivery, so the advantage of van delivery from a franchised operation is maybe not so great these days. The products are also quite expensive when compared with the competition, even at the bottom end of their range. Expect to pay up to £52 for a 15kg sack for natural recipes, £28 for the wheat based foods. potato 47%, fish meal 21%, peas 7.5%, poultry fat 7%, beet pulp 5%, full fat linseed, brewers yeast, egg, fish oil, dicalcium phosphate, lucerne, limestone, salt, fructo-oligosaccharides 2,000mg/kg, glucosamine 400mg/kg, vitamins and minerals.